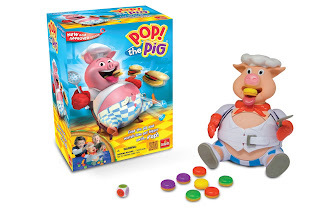 Pop the Pig® is an international preschool classic that is adored by millions of children. It's said to be the #2 best-selling new kids’ game of the last five years in Europe and the US! Inside the colourful game box is a roly poly plastic pig with a wide mouth and a fat belly. The game starts by the first player rolling the die. The number on the die corresponds with a number on one of the plastic burgers. The burger is then ‘fed’ into the pig’s mouth and the player pumps the pig’s head according to the number on the die (and the burger). The next player continues and so on. As players roll the die and pop a hamburger into the pig's mouth, the pig’s belly gets bigger and bigger. The more players pump pig’s head, the more his belly grows until . . . pop! Kids love the suspense as they watch his belly grow; the player who makes his belly burst loses the game. This is a very child-friendly game as it has no batteries and is easy (and fun) to play, even without adult supervision. Children can quickly reset this game with one pump of the pig's head and experience consistent belly-busting game-play each and every time. Players aged from 4 upwards can engage in the game, with 2 to 6 players. Play time is 30 minutes or less so there is not likely to be any boredom – or squabbles, come to that.